Numeric UPS* bagged the most Prestigious SD's No1. Power Electronics Company of the year award for the 25th consecutive year, making it the largest winning streak unheard of in the Power Electronic Industry vertical. The company is also the largest manufacturer of Online UPS Systems in India making it the SD's No.1 Online UPS Company of the year and also the SD's No. 1 Line interactive UPS Company of the year awards. All the three firsts related to UPS went to NUMERIC UPS, making it the most successful UPS brand in the country. The company netted the total revenues of 625.45 crores, down from 635.19 crores, a small dip of 1.53% over the previous years turnover. This minor dip may be attributed to change of leadership at the top. (*Numeric UPS is part of Legrand Group. The registered Indian legal entity is known as Novateur Electrical & Digital Systems Pvt. Ltd. which comprises of 3 Brands / Divisions Legrand, Indo-Asian and Numeric*,) but the turnover figures printed are purely of Online & Inline UPS Systems. APC - Schneider's UPS sales to be around 664 crore. Vertiv - Liebert revenue dropped is some where around 590 crore. First Emerson tried to spin of as Vertiv, before finally being taken over by PLATINUM EQUITY, A US based equity firm. So fresh operation may start post December. Eaton's Power Quality revenue is around 154 crore. These figure are just SD's estimates through our own market sources & our contacts within the company and information coming out of Government agencies. Here it is worth mentioning that Govt. 's Right to Information policy has come good to evaluate the unknown to a certain extent. Hitachi Hi-Rel Power Electronics Pvt. Ltd. Gandhi Nagar, Gujarat which went for major re-positioning in the last two financial year has teamed up with Hitachi. And has finally started delivering. This teaming up has worked wonders for the company but not that much in the UPS field but has started emphasizing as the company started giving more emphasis on Drives for which they have set up a huge plant in Sasan, Gujarat. This year Softdisk estimates the company to have netted revenues of 382.70 crores for UPS & SPCUs. Of which 176 crores are thru sales of UPS alone. Consul slipped one rank behind although showing growth over the past year being adjudged the SD's No. 3 Power Electronic Company of the year. The company netted revenues to the tune of 340.00 crore, up from previous year turnover of 270.00 crore. However Consul's are also the SD's No.2 Online UPS company of the year with UPS sales amounting to 240.00 crores. All these makes Consul - A high growth company, especially in the wake of extended interest in the Solar business which is evident from its acquirement Pune based Megatech a predominantly solar oriented company & Neowatt - famous for its technical expertise in both custom built UPS Systems and Solar field. Next in the league was the company, with huge jump in turnover making it among the 4th spot in the SD's top 10 club, Kolkatta based Switching AVO Electro Power Ltd. Switching with a revenue of 216.00 crore emerged as SD's No. 3 Power Electronic Company of the year. Switching growth of 28.22%. Switching AVO are also the SD's No. 3 Online UPS Manufacturer of the year. A no mean achievement by itself. 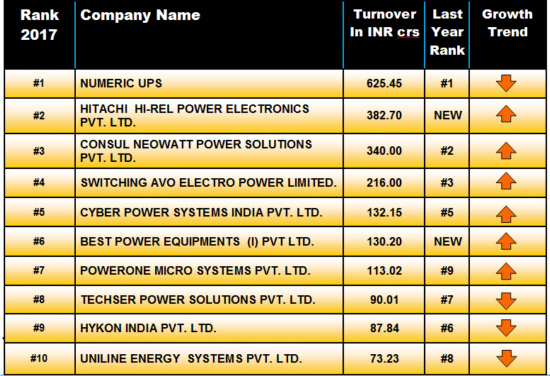 Mumbai based CyberPower Systems maintained its position in SD's top 10 club by grabbing SD's No 5 position in this years SD Rankings. 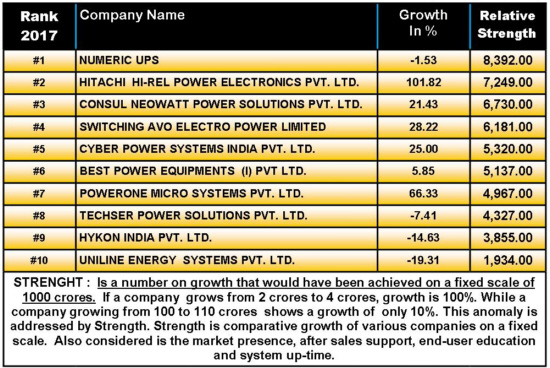 CyberPower netted revenues to the tune of 132.15 crore being crowned SD's No.5 Power Electronic Company, CyberPower are also the SD's No.2 Line-interactive UPS Company of the year with 32.29 Crore being generated thru line interactive sales. Next in line are the New Entrant BEST POWER EQUIPMENTS (I) PVT. LTD. BPE netted revenues to the tune of 130.00 crore being crowned SD's No.6 Power Electronic Company for the year 2017. Next in the league is Bangalore based PowerOne Micro Systems Pvt. Ltd. which jumped two spot to claim the coveted SD's No.7 company of the year. (the company has climbed 2 ranks over the previous year.) The company netted revenues to the tune of 113.02 crore, making it the SD's No. 7 Power Electronic Company of the Year. Last year the company had netted revenues to the tune of 67.95 crores, a major jump considering, considering the average industry growth to be around 6.27%. Company's tagline is to save the bottom line. For the first time the company crossed the turnover of 100 crores and that to without compromising on margins speaks volumes about the the quality and acceptance of their product. Next in the league are the Bangalore based Techser Power Solutions Pvt. Ltd. They were crowned SD's No. 8 Power Electronic Company of the year. The company slipped by one rank over previous year. Company's growth dipped by over 7.0% has been due to the increased competition and non completion of orders in hand, No wonders, if company ends up even higher in the top 10 rankings chart in the coming years, Signals to this effect are already visible. The company netted total revenues of 90.01 crore up from 97.21 crore it had in 2015-16. Of the total revenues of 97.21 crores 83.77 crore came thru sale of online UPS, which makes it the SD's No. 5 Online UPS Manufacturer of the year 2016-17. Next are the Hykon India Pvt. Ltd., A Thrissur, Kerala based company which this time could not repeat its last years performance, and could manage only 87.84 crore as against 102.89 it nettet last year, a huge dip of 20.00%. The company has been showing upwards trend ever since it entered the SD's Top 10 Club. Hykon are also the SD's No.3 Line-interactive UPS Company of the year with 19.36 Crore being generated thru line interactive sales. We are witnessing a steady growth, year after year in Hykon, last year was a slip as we missed a few contracts very narrowly. This year we are confident of bouncing back laments Mr. Christo George, MD, Hykon. Last on list were the Delhi based Uniline Energy Systems netted a turn over of 73.23 crore in 2016-17. 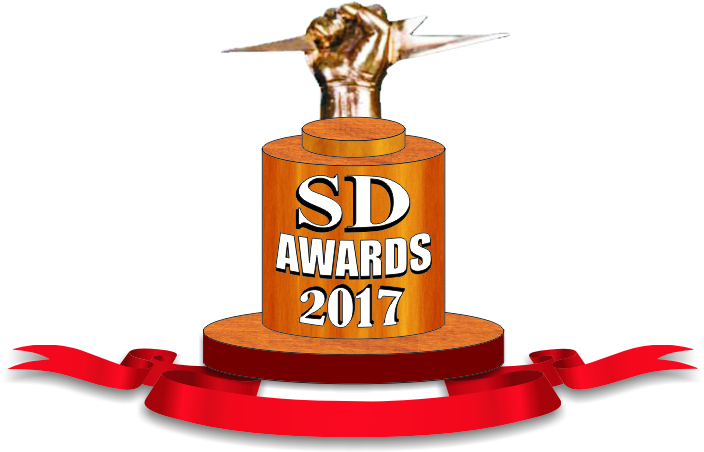 The company was crowned SD's No. 10 Power Electronic Company of the year. Conclusion: The 2016-17 can be termed as a relatively flat year for the SD's Top 10 UPS Companies. Some of the UPS companies grew well above the industry average while other failed to achieve what they had last year, at a time when margins are squeezed. Volume wise there is increase in sales of almost 16.0%. In all 313 companies responded, while only 178 companies ware rated. Softdisk believes slowdown has taken the rosy freshness out of the business, but with GST implemented and Modi Govt. at the centre and lots of FDI already promised, it is going to be good times ahead post UP election. These rankings are limited to the companies responding to our survey and data provided by them.